I also got a new keyring at Brighton. I have a bunch of keys that are no longer in use, so I cleaned out and made them look a little nicer. 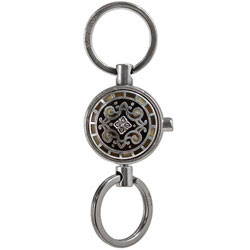 My friend once likened my key ring to a "Jailer's Ring"because there were so MANY keys on it. Now that I work from home, I am down to a house key and a car key. Wow, it feels so light! And Mark bought me a wee souvenir at the Tut Exhibit. You know there is something so wrong about him being plastered on everything from coffee mugs to pencils. Hey call me a purist! 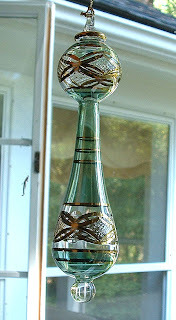 BUT, I do have quite a collection of Egyptian perfume bottles. (Note to self: get a picture of those!) I saw these ornaments and just had to get one. I am happy with my choice. now I just need to find the perfect place to hang it! 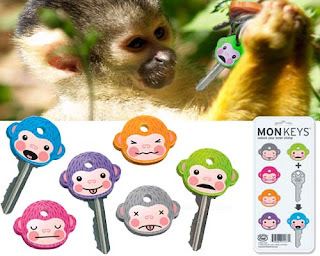 LOL-Those Mon Keys are so cute and funny. I want some for myself.